Toolkit￼ Wild Zones: How to Create and Enjoy Them is a toolkit created by Wild Zone co-founders Karen Payne and David Hawkins. It includes Background on Wild Zones, Menu of Possible Activities, Sample Guidelines and Rules, Checklist for planning Wild Zone events, examples of various ways to structure Wild Zones in different situations, guidance on the role of adults in free play, information on training Play Rangers, suggestions for community organizing, sample letters for requesting donations and recruiting volunteers, research, references and links to other resources. This Toolkit is a work-in-progress. We would appreciate any feedback and suggestions on how it can be improved. We’d also like to hear about your own experiences with Wild Zones and Family Play Days. Please send your feedback, stories or photos to Karen Payne. Download PDF of Toolkit (current version 1.01). The Concept Paper How do Wild Zones meet the needs of children and families? How can Wild Zones be developed? Where will Wild Zones be located? Read the full Concept Paper: Download PDF. © 2007-2010, Wild Zones. All rights reserved. 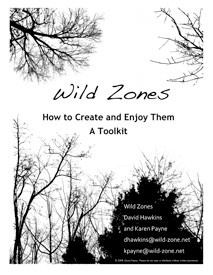 Wild Zones: How to Create and Enjoy Them is a toolkit created by Wild Zone co-founders Karen Payne and David Hawkins. It includes Background on Wild Zones, Menu of Possible Activities, Sample Guidelines and Rules, Checklist for planning Wild Zone events, examples of various ways to structure Wild Zones in different situations, guidance on the role of adults in free play, information on training Play Rangers, suggestions for community organizing, sample letters for requesting donations and recruiting volunteers, research, references and links to other resources. This Toolkit is a work-in-progress. We would appreciate any feedback and suggestions on how it can be improved. We’d also like to hear about your own experiences with Wild Zones and Family Play Days. Please send your feedback, stories or photos to Karen Payne. Download PDF of Toolkit (current version 1.01). How do Wild Zones meet the needs of children and families? How can Wild Zones be developed? Where will Wild Zones be located? Read the full Concept Paper: Download PDF. © 2007-2010, Wild Zones. All rights reserved.